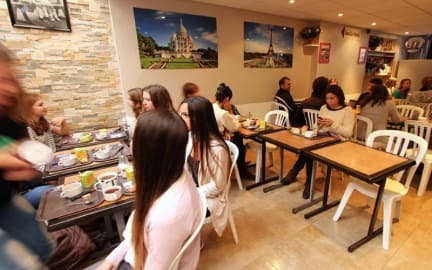 Auberge Internationale des Jeunes i Paris, Frankrike : Boka nu! The Auberge Internationale des Jeunes AIJ, is a friendly youth hostel in the center of Paris, ideally located in the 11th arrondissement. During your visit in Paris, you will certainly be looking for a nice and comfortable place to stay. AIJ represents the best alternative for young travellers, as it combines an excellent location, a good quality lodging (clean, safe and nice) and the most competitive prices in the City of Lights (recommended by Lonely Planet). Pillows, blankets and fitted sheets for the mattress are provided. No access to the bedrooms during the cleaning time (between 11 am to 3.30 pm). Breakfast is daily served from 7 am to 9.45 am. Common room with vending machines is also available. Please note: Maximum age for guests is 30 years old. Any bookings made for a person over 30 years old will be refused by the hostel. Auberge Internationale des Jeunes is designed to accommodate young audiences as part of a short-term tourist accommodation (no more than one week). The hostel is ideally located right in the city centre of Paris, in the safe and lively Bastille district. Metro (stop “Ledru Rollin”, line 8), buses and a taxi station are available at less than 200 meters from the hostel. There are many pubs, cafés and restaurants nearby, as well as four different supermarkets at less than 500 meters and laundromats. 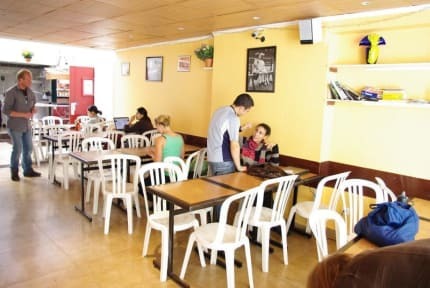 The hostel offers both private and shared rooms for 2, 3 and 4 people (maximum). Showers and toilets are located on each floor. All the rooms for 4 people have their own private showers and toilets. No access to the bedrooms during the cleaning time (between 11 am to 3 pm). Pillow, pillow case, blanket and 1 bed sheet for the mattress are provided. You can rent bed sheets (3€) and towels (2€) separately. In case of late cancellation or no show the balance of your first night will be charged in order to confirm your booking and is non-refundable. No access to the bedrooms during the cleaning time (between 11 am to 3.30 pm). Helt okej frukost. Ligger bra till den stora tågstationen. Men det fanns ingen tvål på toaletterna, det kändes lite äckligt. Creaky doors, no soap, bad breakfast. This hostel does Not live upp to the expectations. The atmosphere is horrible and its never quiet. The rooms are bare and discusting, you feel dirty all over. Stricly speeking - you pay for a used madress. Nothing more. The price is low but if you take in the feeling of this "hostel" its not worth it. We checked out earlier due to the fact that all the clamoring måst it impossible to get any sleep at all. Do not go here!! !